I was at work this week and a Sister asked me how my daughter, Kiowa was doing. Kiowa has been stationed in Japan for 2 years now and with the threat from North Korea, the Sisters have been faithful prayer warriors. This question led to a conversation about world events (such as the school shooting in Florida and the mass killings in China) and how much hopelessness there is in the world. I mentioned how all of this despair can cause anxiety and worry and she mentioned the Bible verse that mentions the Proverbs 31 woman who can laugh at the days to come. I reflected on that verse for the rest of the day and looked it up as soon as I got home. Having the ability to laugh at the days to come takes faith in God. Something that comes and goes with me. I can be the epitome of faith at one time and completely lack faith at another. Thinking about the days to come can cause me to shake in my shoes. Why is that? If I have complete faith in God like I’m supposed to, then why is it so hard for me to trust God with the days to come? Aren’t Christians supposed to have faith in God at all times? WHY IS IT SO HARD? Pray: God blesses us when we pray. God gave King Solomon wisdom when he prayed for wisdom and God will give us faith when we pray for faith. When we pray, God moves mountains on our behalf. He will answer our prayers for faith. Read the Bible: The Bible encourages us to be strong, to be courageous and to have faith. When we read the Bible we fill ourselves with the promises of God. We fill ourselves with the power of God through the Holy Spirit. I remind myself that even King David’s faith wavered at times. The disciples didn’t always have faith. Peter denied Jesus 3 times, because he didn’t want to face the persecution that came with being a disciple. I am human. There are times when I may not have the faith of David facing Goliath, but the Bible says that if we have the faith of a mustard seed that NOTHING will be impossible for us (Matthew 17:20). Certainly, I can summon the faith of a mustard seed! As the enemy continues to create chaos around the world and we see the pain and heartache caused by the evil he unleashes, I know that I really need to focus on becoming that woman that can laugh at the days to come. I need to be in constant prayer and I need to be meditating day and night on the Word of God, so that I will be able to trust God completely with whatever the future holds. I don’t want to be that Christian that is found cowering in the corner, biting my nails, fretting over what may happen. I want to face the future with courage. My challenge to you: if you find yourself lacking faith, I challenge you to pray and dig into the Bible. The world is a scary place and things aren’t getting better. We all need to find the faith to face these events with courage and faith. 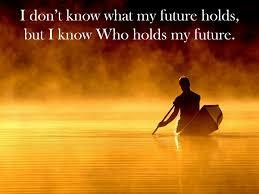 We all need to be able to trust God with our future. The goal of ALL Christians should be to have the faith of the Proverbs 31 woman and be able to laugh at the days to come. If we can not summon that faith then we will find ourselves locked in a prison of worry and fear. If you find yourself struggling in your faith, or suffer from anxiety, worry or fear, contact me. I am here to pray with you and encourage you. I will walk with you as you build your faith in God. I know how hard it is. I’ve been there and on some days am still there. You do not have to suffer alone.